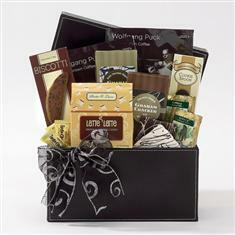 Give the gift of enjoyment when your clients sample the contents of this classic 10" faux leather black box. Our Wolfgang Puck Coffee Sampler is sure to create some warm feelings. Included are; chocolate biscotti, a chocolate covered cookie spoon, white chocolate dipped graham cracker, chocolate covered graham cracker, Wolfgang Puck signature coffee, vanilla tea sachets, and latte coffee candies. A food gift that will bring smiles!